So we went downstairs to look for her again to know what`s going on… The lady we got was not there.. So we spoke with the lady that replaced her and explained the situation to her. Lucky that lady was able to find us something (pool view) or else I would have complained to the manager or something as we felt cheated from the first lady. She took our money but didn’t actually upgrade us! Shame on her! Then, the hotel was so big, we got lost to get to our new assigned room. We asked an employee. That person redirected us to a longggg route to get our tower. Anyway. For the money we paid, we find that our room is not worth it. We had other friends that came at the same time for this celebration but stayed at Aria and Caesar… we visited their room and we regretted to pay so much for Bellagio when they paid less and the room was nicer and bigger. Who would know.. The 2 most important persons of this trip stayed supposedly at the most beautiful hotel but got disappointed. 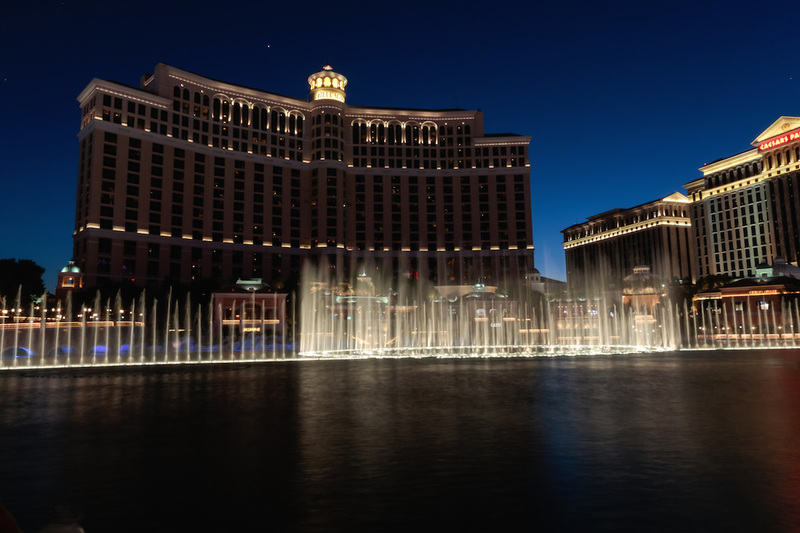 We didnt say “Woaw” for Bellagio. We did for Caesar, Venetian, Mandalay Bay etc for different things. Other than that, we tried the buffet at Ballagio. It was good. We tried the pool. It was nice but the pools at other hotels were as nice or nicer. The best thing maybe about this hotel is the location! We liked the Casino at Bellagio though. We arrived at the Bellagio at around 10am on a Sunday morning. We did not pick any line just took the next available window. I did the $20 sandwich trick and told her we were back for our 4th stay and we were celebrating our 31st anniversary “would you have any complimentary upgrades?” She told us that AT&T had a convention going on and there would be no fountain view rooms available. She did notice that I had been in contact with their concierge before our arrival (to surprise my wife with spots at Cypress Pool) and she made a few calls to verify it. She then offered an upgrade to the Resort Tower King corner room (she told us a $70/night upgrade) which gave us views of the mountains and the main pool area~ very nice. The best part is that the elevators took us directly down to the pool area…no need to walk through the shop areas. Not a biggie, but was nice. All in all a good score. Checked in about 5:30-6:00 on Easter Sunday. I was hoping for a male clerk and as luck would have it that’s what I got. I handed him the sandwich and asked him to check for any complimentary upgrades. He said “of course” and started checking. I originally booked a Bellagio suite so I’d at least be happy with what I had in case he couldn’t upgrade us. I did my homework on the various suites and decided to shoot for the moon and ask for a Grand Lakeview. That was immediately nixed and he offered a Cypress suite, which I declined. I explained that since there were 3 of us I wanted to keep the 3 bathrooms that I had booked, and the Cypress only had 2. I then asked for a 2 bedroom Penthouse suite. He came back with a top floor Penthouse suite. I knew this had 3 bathrooms and about 500 more square feet of space. I accepted this and was so glad I did. This was the least I was going to settle for and it worked out for the best. This goes for about $200 to $300 additional per night and was mine for a 50 spot. Best room we’ve had in Vegas in 5 trips. So happy I found this site. Thank you Front Desk Tip. Checked in near midnight Friday with another couple. They received a standard spa tower room. I tipped $50 and received a corner spa tower room. She also gave us buffet/cafe line passes and sent up chocolate covered strawberries and champagne for our anniversary. I wish I had pushed for a fountain view but they seemed very busy this weekend. K not going to get into great detail as I’m truly frustrated over the rudeness of Bellagio. I booked a resort room and asked nicely if there was any free upgraded rooms available? But before that time I gave her my ID, Credit card and $20. She didn’t type on her computer or anything just said NO we have none available. I said ok give me back my $20 and she was trying to keep it. The person who was working next to her called a manager and I told the manager how I was looking for a free upgrade from my resort room and your employee tried to steal my $20 bill. The manager told her what she was doing is considered stealing and to give it back or else she would be fired. Basically never again will I trust Bellagio. I should’ve stayed at the ARIA where $20 will get you a way better room. Young male, late 20’s, very nice, very friendly. 5 pm Thursday 6/21/12. My wife handed the clerk Cr. card, license and a $50 since we had 2 rooms on the reservation. My wife asked for an upgrade to Salone lake view. He tried really, really hard to find any upgrade he could but couldn’t unless we wanted to move rooms mid-trip. We didn’t want to do that so we accepted comped buffet passes instead. Which, if you think about it, the buffet at the Bellagio is quite pricey so those comps. were worth it. We’ll try the $20 sandwich again this fall. The 2 of us arrived at hotel around 2pm on a Friday. It was moderately busy but we didn’t have to wait long to check in. We were helped by a young Hispanic woman. I gave her the “sandwich” and right away she said “Oh I see you’re looking for an upgrade today”. I quietly acknowledged and she said the Fountain View rooms were sold out, but we could be upgraded to the newly remodeled King corner room with pool views. We accepted and couldn’t have been happier! Huge remodeled room with pool views from the living area and desert/mountain views from the bathroom. Can’t wait to try again in a few months. Also, this trip was booked for 4 nights using a 3 night comped offer. Was really skeptical that this would work on free nights but it did! Walked into hotel about 6 hours before check in, handed the young female clerk the 20 dollar sandwich and asked for a complimentary upgrade. She left the money in plain view the whole time and went immediately onto the computer and searched for what she had. I asked if we could get a fountain view room and we did. She asked if we needed anything else, and I asked for a buffet and cafe line pass (these are very necessary, as the bellagio buffet line is forever long!). She filled one out for us without even flinching and handed it over. We didnt wait in line during our whole visit…which was excellent! Worth the $20 without a doubt! My wife and I arrived in a super-crowded hotel and front desk area around 11pm on a Wednesday. As I asked for our “complimentary upgrade” the woman kept asking about staying Friday night too. We were booked Wed-Friday and I believe that was the only hurdle in the way for an even sweeter upgrade. If staying in the middle of the week, go for the big upgrade! It was easier than expected!